According to statistics, of all the couples trying to conceive, only 30% get pregnant within the first cycle, 85% within 12 months, and others need a few years and perhaps medical intervention to get pregnant. And almost every mother-to-be, no matter how much time it took to conceive, reads everything and anything about pregnancy to ensure her baby’s well-being. Unfortunately, there is a lot of false and inaccurate information on the internet that sometimes can be harmful. We at Bright Side have collected several popular “scientific” facts and recommendations that pregnant women may find on the internet and explain why they should not be followed. 1. Wide hips make giving birth easier. Wider hips mostly refer to a wider ilium — the largest and uppermost part of the hips. But in fact, the distance between the iliac crests has nothing to do with the size of the birth canal. It is the form and size of the round hole in the middle of the pelvis that counts. It is called the pelvis inlet and can be the same whether a woman has very large or very small hips. 2. The size and shape of the belly indicate whether the baby is a boy or a girl. It would be very convenient to identify the gender of a baby this way, but, unfortunately, it’s not as simple as that. There are 2 things that can affect the shape and size of a pregnant woman’s bump: the size of the fetus and its position in the womb. 3. Multiple ultrasounds are not safe for the baby. There is no scientific evidence that a properly performed prenatal ultrasound can harm a mother or her unborn child. An ultrasound does not use radiation; it uses high-frequency sound waves that bounce off the baby to produce an image. But the intensity of those waves is very low, and the procedure is pretty fast. So the only risk the pregnant woman has is an unnecessarily prolonged procedure or when untrained users operate the device. 4. It’s bad for the baby if you lie on your belly. The baby is hidden deep inside the muscular uterus and protected. A pregnant woman can lie and sleep on her belly as long as it’s comfortable. If it feels OK, it won’t harm the baby. 5. You can’t run while you’re pregnant. Being pregnant doesn’t mean you should give up running. If a woman has an uncomplicated pregnancy, it is safe and healthy for her to run during all of the trimesters. Of course, you should avoid running if you have complications like elevated blood pressure, a multiple gestation pregnancy, or you simply didn’t use to run before. 6. Morning sickness happens only in the morning and only in the first trimester. Morning sickness is the most frequent symptom of pregnancy. Up to 80% of pregnant women experience this problem in some way, but only 2% suffer only in the morning. Despite its name, it can occur at any time of the day. Some experts have even proposed calling it “all-day-sickness.” In the majority of cases, it ends after the first trimester, but up to 20% of pregnant women experience it until delivery. 7. You can’t lift your arms above your head because it can strangle your baby. Raising your hands can’t cause the umbilical cord to wrap around your baby’s neck — that’s certainly a myth. The truth is that your movements can’t have an affect on the umbilical cord. Besides, many babies are born with the umbilical cord wrapped around their neck, and the doctor usually removes it with one or 2 maneuvers. 8. You should get rid of your cat. Cats can carry a rare disease known as toxoplasmosis, which can cause birth defects in children. But this doesn’t mean you should give up your pet as soon as you get pregnant. It’s better to avoid cleaning the litter box though. Or if you don’t have anyone to do it for you, don’t forget to wear disposable gloves, and wash your hands immediately afterward. As for toxoplasmosis itself, the most common way to contract it is by eating raw or undercooked meat. 9. All women feel happy during pregnancy — it’s the best time of your life! Everyone thinks that pregnancy is the happiest time in a woman’s life, but many pregnant women experience stress, confusion, fear, and other unhappy feelings. 14%—23% of women even struggle with some symptoms of depression during pregnancy. This happens because hormone changes can affect the brain and its chemicals. Depression should be treated, or it can have potential risks to the mother and the baby. 10. It’s OK to have a drink once in a while. 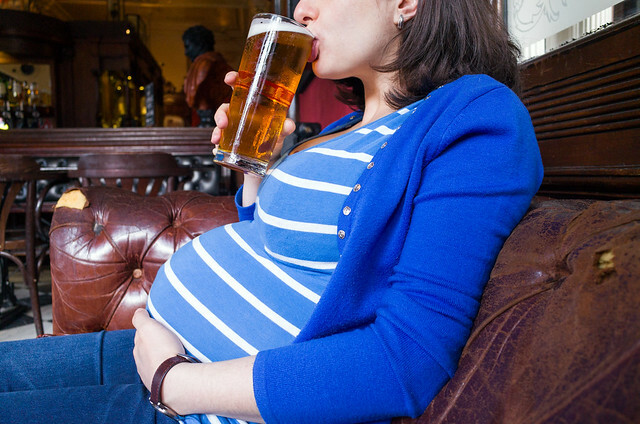 When a pregnant woman drinks a glass of wine or beer, so does her baby. The alcohol can pass freely through the placenta. Drinking during pregnancy increases the risk that the baby will be born with some physical, mental, or neurobehavioral birth defects. This has a scientific name: Fetal Alcohol Spectrum Disorder (FASD). Due to the fact that no doctor can tell you the exact amount of alcohol that causes FASD, there is no safe portion of alcohol, and it’s better to avoid it throughout pregnancy. 11. You lose all your pregnancy weight during the delivery. Pregnancy weight is a combination of the weight of the baby, the placenta, the growing uterus and breasts, an increased blood and fluid volume in the woman’s body, and some extra fat. Right after giving birth, you will immediately lose the weight of the baby, the placenta, and the amniotic fluid. Over the next few weeks, you should lose the weight of the fluid. And what remains is the extra fat that a woman gains during pregnancy. And the time you’ll need to lose this depends on how much you’ve added. 12. A C-section is the easy way out. Many pregnant women prefer a C-section to a vaginal delivery, even if there are no medical reasons for it. 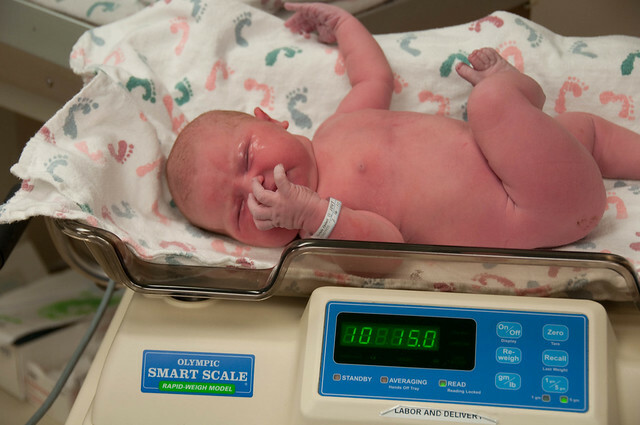 This happens because many believe a C-section is less painful and safer. At least this is what some unreliable information sources say. In reality, a C-section is painful, but, unlike natural birth, the pain starts after the baby has been born. Also, it can be associated with future complications. A C-section is recommended by doctors only when it can save the mother’s or the baby’s life. 13. The fetus is not affected by what happens outside. For years, it was considered that babies were born without any knowledge of the outside world. Doctors now realize that a baby can hear sounds, especially their mother’s voice, which calms them down. They can see the light outside your belly and turn away if it’s too bright. They can taste the food you’re consuming by sniffing and licking the placenta and the uterine wall. And they can have dreams and react to the world around them. So they are pretty much affected by everything that happens outside. So don’t believe all the do’s and don’ts you read online or your grandmother tells you...if she’s not an obstetrician, of course! Do you know some other myths everybody believes that you think are ridiculous? Share them with us in the comments section.